Fourth Row Center: Film Writings by Jason Bailey: In Theaters: "The Young Victoria"
Perhaps the nicest thing I can say about Jean-Marc Vallée’s The Young Victoria is that it didn’t put me to sleep, and that is no small achievement. This kind of regal costume drama is usually anathema to me; I recognize that they’re usually well-made and exquisitely crafted, filled with intricately-designed costumes and exquisite props and so forth, but more often than not, they just put me to sleep. That is not the case here; director Vallée seems aware of the dreary pitfalls of the historical drama and, for the most part, manages to avoid them. It does have some slow, dozy moments, but Vallée keeps things moving at a brisk pace—his visuals are well-composed, and his cuts have a nice snap to them. And, of course, the design elements are impeccable; a lavish royal dinner is particularly notable for its fetishistic attention to detail, reminiscent of Martin Scorsese’s Age of Innocence (not coincidentally, Scorsese is credited as a producer on the picture). 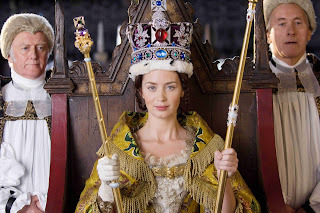 Emily Blunt ably plays the title character, Queen Victoria of the United Kingdom, during the first years of her reign. The opening sequence handles a healthy slab of background exposition (always necessary to get our political and geographical bearings) with a fair amount of panache, though there a couple of clumsy time jumps that we probably could have done without. From there we see how the young heiress presumptive was isolated and pampered (throughout her youth, she could not descend stairs unless she was holding someone’s hand), and how she was pressured by her mother, the Duchess of Kent (Miranda Richardson), and her mother’s lover, Sir John Conroy (Mark Strong), to sign on to a regency. Once she turned 18 and King William (Jim Broadbent, in a delightfully batty performance) died, she took the throne; the political wrangling of her early monarchy are detailed, as is her courtship and marriage to Prince Albert (Rupert Friend). The scenes of political maneuvering are well-paced, if marginally confusing. Of greater interest is the picture’s mining of the complex mother-daughter relationship between Victoria and the Duchess of Kent, and the evolution of her relationship with Albert, which begins as a more political one than it becomes. The screenplay by Julian Fellowes (who penned the equally energetic Gosford Park) shifts gears between its story threads well. Victoria is a headstrong, fierce character, played to the hilt by the gifted Blunt. It’s a spirited piece of work, notable less for the line readings (though they’re all skillful) than for the way Blunt finds and plays the little, personal moments between the lines; Victoria (in this interpretation, anyway) wasn’t a dull, dour monarch, but a bright and vivacious young woman. It’s a sharp piece of work with real spark. Richardson’s stifling (and then stifled) mother is nicely matched, and Paul Bettany smartly underplays Lord Melbourne, who has Victoria’s ear to a degree that could be to her detriment. Strong is admirably slimy as Sir Conroy, though there’s an unfortunate lack of subtlety to his villainy (come on, they have him kick the dog? Really?). The climax comes in the form of a striking (and, come to find out, historically inaccurate) moment of violence that is completely unexpected and entirely effective. Unfortunately, the ending that follows is equally unexpected—the picture draws to a close abruptly, suddenly, and a bit strangely, feeling a bit like a rush job (or like Fellowes couldn’t find the right off-ramp from the story). The Young Victoria ends with a dash rather than a period, which is an unfortunate final note for this otherwise sturdy character study. "The Young Victoria" opens Friday, December 18 in limited release.